I gotta say it: I am just SO DONE with James Robinson’s run on Wonder Woman. This is just a trainwreck, I haven't been able to write a single positive review for his entire run so far. Oh, where to even begin. I've written reviews for the entire series, but it boils down to him getting everything wrong. First off, the series he's writing isn't Wonder Woman. Functionally speaking he's writing a tie-in to the New52 event "Darkseid War", since all of the plotpoints originated in that series and had no presence at all in Wonder Woman's own series before he took over the writing duties. Plus, everything he's setting up looks like it's going to be resolved in a Justice League event of some kind instead of later in this series. That's insulting to the series readership, since it is literally impossible to have understood what's happening without reading a separate comic, and it probably won't get any payoff without reading yet another comic. Within these issues themselves, Wonder Woman flat-out isn't the main character. When it comes to number of appearances, there have been two issues where she didn't appear at all, whereas her brother Jason (Who was first introduced in the Rebirth relaunch, again meaning that his story is not from this comic) has appeared in all but one. When it comes to story purpose Jason again outstrips her, since every issue has been about finding Jason, getting his backstory, and talking about how everything that's happening is about him. It is eventually revealed that the entire plot of the first seven issues wasn't about Diana at all, but she was literally just the bait to draw out Zeus, and in the climax of the arc she is literally ineffectual as she doesn't manage to actually involve herself in the Darkseid/Zeus fight at all, and takes no part in driving off Darkseid since the Justice League shows up and does it themselves. She is literally a side-character. Then there's the way he is spitting in the face of everything that Greg Rucka did with his thirty-five issues on the title as part of the Rebirth relaunch, which I find to be real-world insulting and derogatory to a great writer. Rucka's entire arc was spent essentially trying to make-up for what was done to Diana in the New 52, when it was revealed that Zeus was her biological father to great fan outcry and the character's great detriment. Rucka's story wasn't focused on an explicit retcon (Since he's a class-act and doesn't want to be a douche to the previous writers), but instead spent his entire run in universe having Diana explore her history and try to make sense of these disparate backgrounds. He got the Greek gods involved, and magic, and hallucinations, and at the end of the day it settled out close to the pre-52 status quo: Zeus might still be Diana's biological progenitor, but if he is then she regards him as no more or less than a sperm donor. She has no emotional connection to him and she emphatically has not spent her life pining for her father feeling that her home on Themyscira was somehow lessened because she didn't know her daddy. Her family is the Amazons she grew up with, Hippolyta is the only parent she ever had or needed, and she is perfectly content with that. 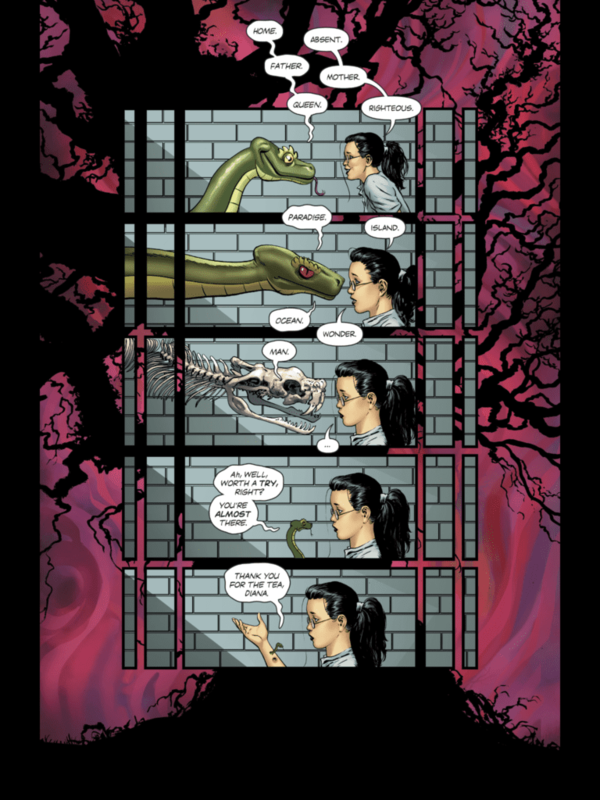 Greg Rucka even included a scene where Diana was doing word-association where her instinctual response to the word “father” was to think of her mother instead. So what does James Robinson do once he takes over? Makes Zeus the confirmed and unequivocal father of Diana (Also Jason, but we can't blame James Robinson for Jason's very existence since that at least was out of his hands), and immediately launches into a seven-part arc about Diana finding this part of her family and desperate to know her father. Crying out for him when he appears and wracked with horrible guilt when he dies because all little girls love their daddies no matter their history. On top of aaaaaaaalllllllllll of that, the comic is just plain bad. It’s poorly written, incompetently edited, with rushed and therefore self-contradictory art. The storyline is redundant and repetitive while still leaving huge swathes unexplained, and spends its entire focus on characters besides Wonder Woman herself. The content is honest-to-god amateur work, this is the finished product I’d expect from somebody working on their first-ever professional story who is unsure how to interact with their editors and are unused to the requirements of regular issues. Since James Robinson isn’t an amateur and there are experienced professional editors working in the series that means it gets no slack from me, and that means that there’s nothing to redeem it at all. I have literally seen people who aren’t comic readers consider coming into the series because of Wonder Woman’s two movie appearances last year, and instead they turn away when they see what they would be getting. This series is literally driving away potential new comic readers. James Robinson’s run on Wonder Woman needs to end already. Just end. Please. I don’t have the energy to keep this up anymore, I literally dread Wednesday every-other-week because I know what’s waiting for me. I spent five hours today moving furniture and carrying heavy objects, filling up a 40′x8′ storage container, and reading this issue was still the most tiring part of my day. This comic is causing me pain, it is impacting my health, it is a burden on my existence. I am begging you, let it stop. Don't worry, everything in the DCU will probably get erased by another reboot within the next 6 months anyway. It's why I don't read superhero comics anymore. (01-26-2018, 07:27 PM)AndrewCrossett Wrote: Don't worry, everything in the DCU will probably get erased by another reboot within the next 6 months anyway. I feel the same about big events after big events non stop. Tired of stories that are all "Yes, we stopped Galactus from this world ending apocalypse..........Oh no! Thanos now want to do the same!". I would gladly take another one of these meaningless, repetitive story events over what we're getting here, at least those are (sometimes) competent. This series has gotten to a point where I am literally using my reviews to say "Here are other stories that have done this better". In just this past issue I had videos from Superman: The Animated Series, Justice League Unlimited, and Superman/Batman: Apocalypse. Each one saying "THIS is how you do it!" Last week I somehow got the release schedule for Wonder Woman mixed up and I thought there was a new issue due to be released. An issue which, due to my commitments, I would be required to read in order to write a review. When I got to my comic shop and saw that there wasn’t a new issue, and confirmed with the guy behind the counter that it truly wasn’t being released yet, the feeling of euphoria that swept through me was something that I can only describe as damn near narcotic. This comic is so bad that just not being subjected to it is enough to engender bliss. I think the last time I felt like this was when I decided to cut myself from Image when they started. Everyone was talking about how crazy good Wildcats and Youngblood and all those Blood......teams were and I read all of the first issues (Still own them) and I was like "What's wrong with me? I don't like them". I think it took me a year to finally decide that if I didn't enjoy them/hated them, that maybe I needed to cut the cord. It's strange hearing Robinson being considered a bad writer. When I was reading comics he was the guy everyone gushed about but few actually read.